Whether you are moving to a new home or just rearranging your furniture, getting your couch through the door is one of the most daunting tasks you face. If your couch is tall, wide and bulky and the doorway narrow or small, it often looks like the couch will not fit through the door without damaging the furniture or the walls. Tilting most couches at an angle helps you guide them smoothly through small doorways without tearing the upholstery. Always ask for help when moving a couch. Measure the couch to ensure it will fit through the door. Using a measuring tape, measure the couch's length, height and diagonal distance. To measure diagonal distance, measure from the bottom of one front leg to the head cushion on the other side. Calculate the door's measurements. Measure the diagonal distance, as well as the width. If the couch's diagonal distance is greater than the door's diagonal distance, you could have trouble moving the couch through it. Remove the couch's legs if you do not think it will fit through the doorway. Pliers, a wrench or a screwdriver allow you to take off most couch legs. Some older couches have nonremovable legs. You might need to saw these off to get the couch through the door. Lay a furniture pad on the floor in the doorway. Determine the side of the room that is the most open and allows you the most maneuverability. Put on a pair of cotton gloves if you need to touch the couch's upholstery. This protects the couch from damage. If the couch is wrapped in plastic, this is not necessary. 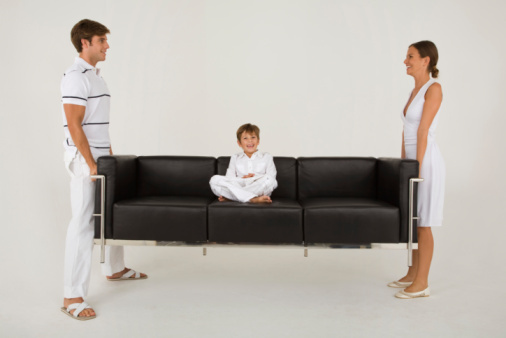 Ask a partner to help you stand the couch up vertically. Tilt the couch so its arms face the most open part of the room. Have your partner stand inside the room so he can guide the couch as it comes through the door. Slide the couch through the doorway, if it is short enough. If the couch is too tall, tilt it forward slightly to allow it to fit through the door. Have your partner grasp the other end of the couch and direct it as you slide it forward. Your partner might need to tilt the couch to the left or right as you slide it through the door. When you fit the couch through the door, set it down slowly and carefully to avoid injury.